When you are in your garden all day, then you have the opportunity to really see who is living in it and who is just visiting. I saved a beetle that fell in the pool, but could not save the dove that flew into our window. The neighbour’s cat loves the company of my chickens and the starlings gather en masse in the fig tree early in the morning to gobble up any left over sweet treat! But the miniature world of the insects fascinates me the most. 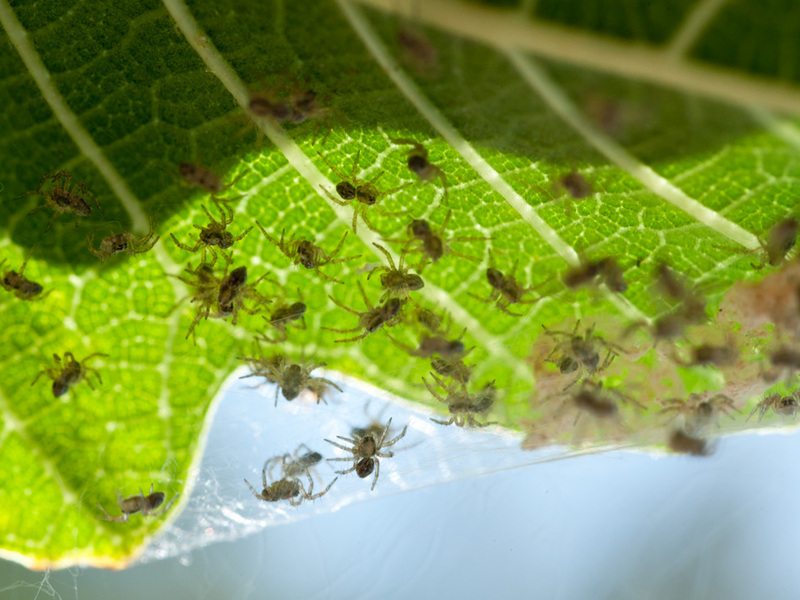 Here is nest of baby crab spiders we found in the fig tree. Crab spiders can be hard to find, but they are definitely around. The reason they can be hard to find is that most crab spider species are able to camouflage themselves with their surrounding areas. Also all of the species of crab spiders resemble crabs; hence their name. Physically the most distinctive crab like characteristics the crab spider has are their two front legs, angled outward and flat bodies. Also the movement of the crab spider mimics the movement of crabs. They walk forwards, sideways and backwards like crabs. Crab spiders in general have neutral coloring, such as light brown to gray tones. The coloring of the crab spider allows them the ability to camouflage themselves to fit into their surroundings. Their shape, flat body and small size, averaging half an inch or smaller, can make them appear to be bird droppings. They can appear in multiple locations like bird droppings, for instance on the sidewalk, patio, roof tops, tree branches and many more locations, anywhere bird droppings can be found. This odd ability to disguise themselves as bird droppings actually gives them an advantage when hunting for food. Even though the crab spider is smaller in size its two longer front legs make it appear to be larger than it’s described. The crab spider’s eyes are all small and act as motion detectors, which comes in handy when they are looking for prey. Crab spiders are able to crawl up places like trees, walls and posts. During the day, crab spiders sleep in an area where they blend well in order to stay out of view of predators. Once the sun falls, crab spiders will move around to find a hunting spot, or they may hunt from the location where they’ve been resting. 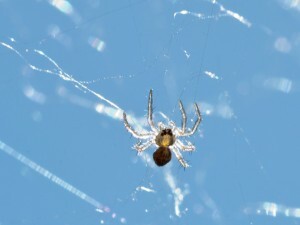 The hunting style of crab spiders is unique in that they will ambush their prey rather than chasing it down or like most other spiders they do not put a web up to trap prey. They will sit and wait in an area where they can camouflage themselves, i.e. grass, flowers, tree bark, fruit, foliage or even cracks and crevices in buildings until they can see their prey. Once an insect of their liking passes their path they will attack. For the most part crab spiders eat small- to medium-sized insects, including butterflies, ants, flies, mites, and bees. When a crab spider has caught its prey, it paralyzes it with its venom and is able to hold it down with its two larger front legs. The venom in the crab spider is powerful; it is believed they are cousins to the brown recluse spider who is very venomous. Yet, the venom of the crab spider is only effective on its prey and not people, unless a person is allergic. The crab spider is not known for being harmful to people, but that doesn’t mean a crab spider will never bite a person. 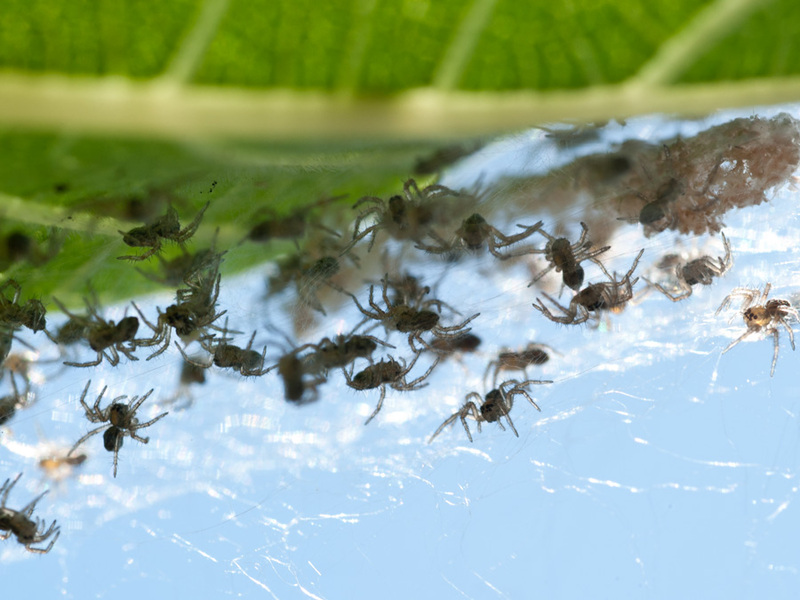 The crab spider’s eggs are deposited into two silken sacs, and are joined together in the center. The female will put her sac somewhere safe and usually stays near by to protect it from predators. The hatch time for the eggs depends on the environment they live in. Who is visiting your garden??? I saw a tiny crab spider today! Not a nest like yours, though – that looks spooky! Have you noticed any particular birds hanging around the fig tree. Those spiders look like they would be a special treat. Spiders are one of my favorite friends in the garden. I like seeing them…knowing they are helping me to control some of the pests. Spiders bring good luck in the garden I have read. You should be very lucky very soon! Nice close up photos, Barbie. 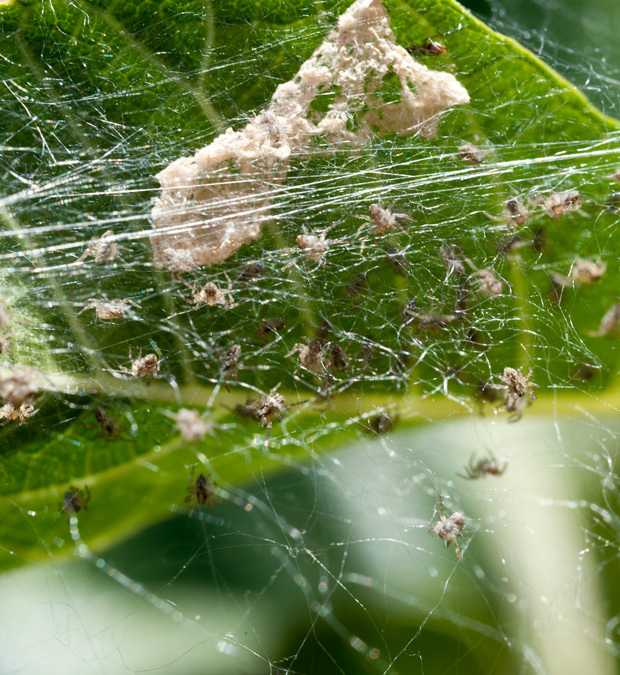 Think of all the bad insects those little spiders will eat. Being close to the fauna as well as the flora is a great reason to garden. Amazing photos, but they reminded me of the John Wyndham novel “Web”, which was a bit creepy. His spiders weren’t as benign as yours! Great shots! 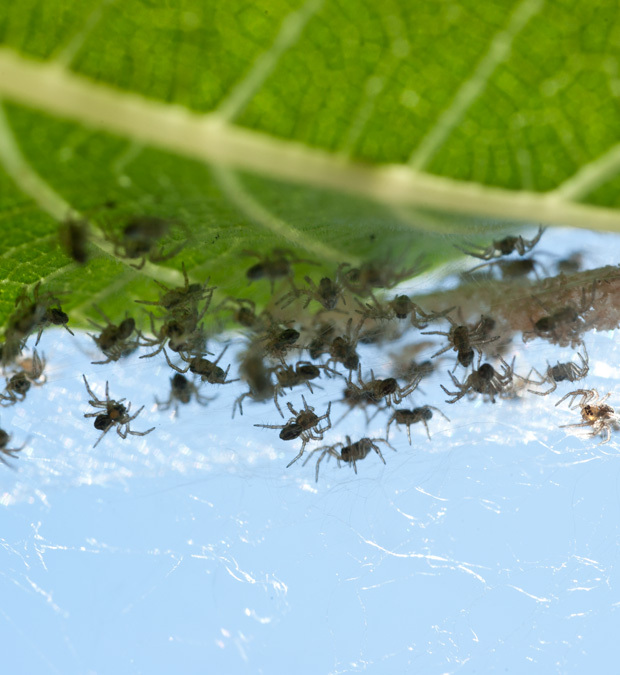 I love finding a newly-hatched horde of tiny spiders! Not as much as the mantis babies though, and definitely not as much as the hope-I-have-them tadpoles in the next couple of months. Oh Barbie, how amazing! 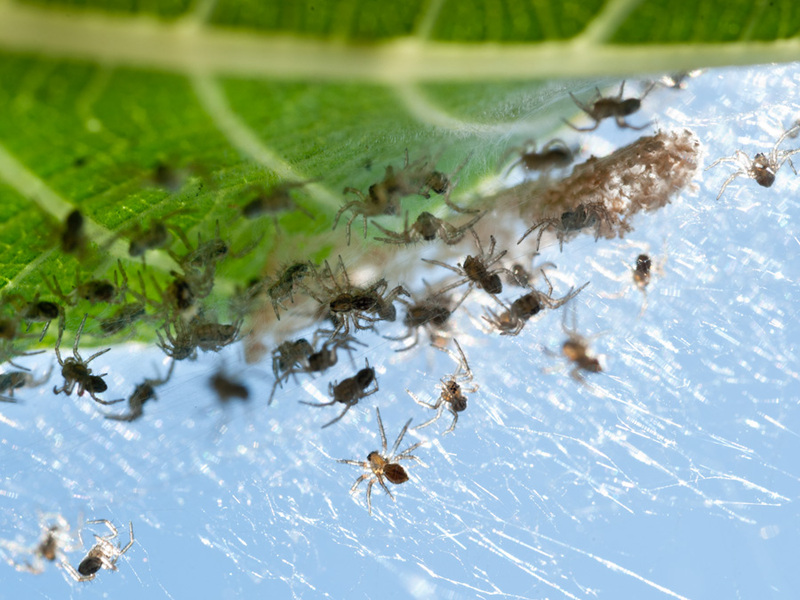 Spiders are so good to have in the garden and you’ll have plenty!